It feels like ages since I started this series, about the rodeo, but in truth it was just last month. I’ve learned a lot since then, attending a couple events and reading nearly everything I could get my hands on. Don’t get me wrong—I’m certainly no expert, but when I recently took a friend who had never been to a rodeo, I felt pretty good about being able to explain the events well enough so he had a basic idea of what to expect. One great thing about taking someone who is completely new to it all is that he saw everything totally different than anyone else. He asked different questions and he gave me a new, fresh perspective as well. This was perfect timing, because with the Ram Rodeo National Circuit Finals just a few weeks away and right up the street from me (April 10-12 in Oklahoma City), I have a lot to write about in the coming weeks and fresh ideas make the words flow more easily. Like most people who have never attended a rodeo, my friend was surprised by how fast-paced and action-packed the evening turned out to be. Not only do the event coordinators keep things moving, but the skill and training of the competitors is simply amazing. While the roughstock events are the most well known and certainly hold an element of excitement like no other, my time spent learning about and watching the timed events gave me a new appreciation for these events. The relationship that exists between the athletes and their horses in order for the ride to be successful is like no other. Take tie-down roping, for example—a lot of people see a calf come out of a chute, a cowboy follow on a horse, rope the calf, tie it up. Bam, it’s done. But there’s so much more to it. Yes, the calf comes out of the chute, with the cowboy soon to follow. 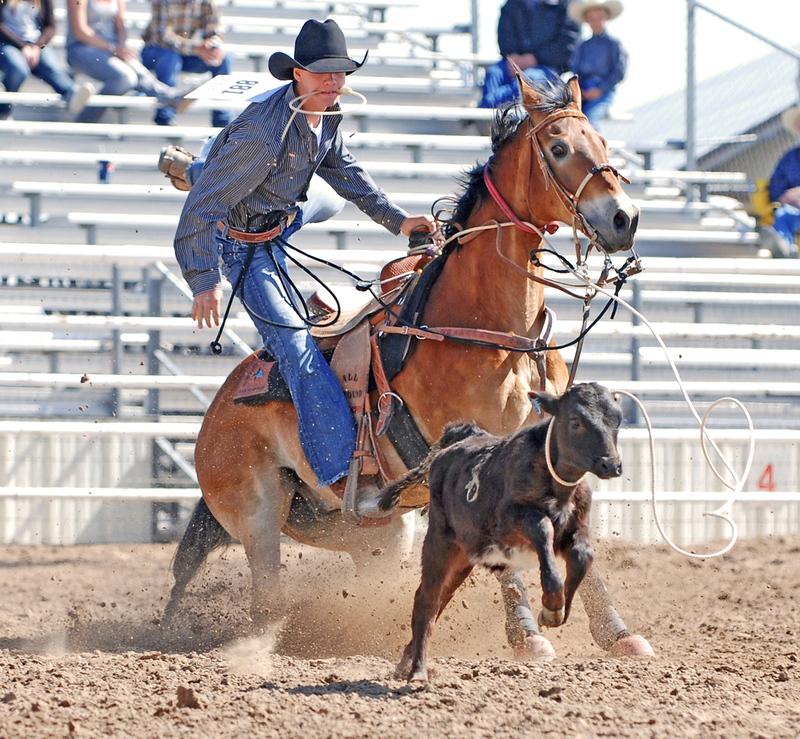 But once the cowboy ropes the calf, his horse is trained to stop so the cowboy can dismount, and as he is running over to flank and tie the calf, the horse steps back just enough to remove any slack in the rope, without pulling too much, which would cause the calf to drag on the ground. All of this happens in a matter of a few seconds and almost before you can blink, it’s over. There are three other timed events including steer wrestling, team roping and barrel racing and every single one of them require a bond between the rider and his/her horse, but each for different reasons. The relationship is about more than just training the horse for the rules of the event. An understanding between a rider and his/her horse can help to make a good ride better, shaving valuable time and improving the safety of both during an event. In a competition where 1/100th of a second can mean the difference between first and second place, that can translate into thousands of dollars in prize money and ultimately where a cowboy or cowgirl ranks in the world standings. The competitors in each of the events at the Ram Rodeo National Circuit Finals in Oklahoma City have not yet been named. But as the competition draws closer, the prize of a $20,000 voucher for a new Ram Truck is surely on the minds of all the potential competitors. How could it not be? The winner of each event gets one. And a new Ram will most certainly provide a much smoother ride than the 8-second one it will take some to win it.